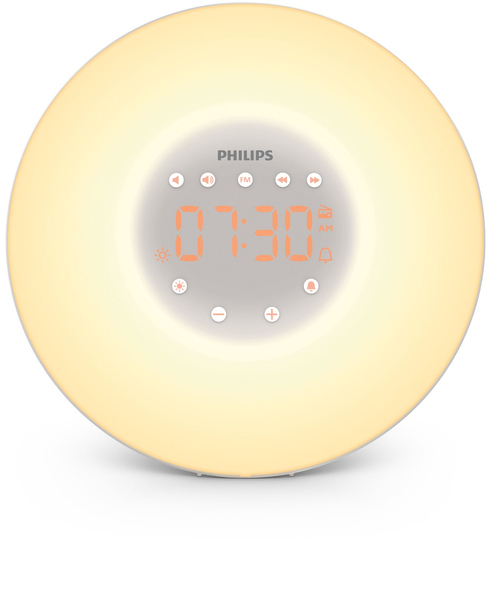 Inspired by nature's sunrise, the Philips Wake-up Light uses a unique combination of light and sound to wake you in a more natural way and leave you feeling more refreshed. Making it easier to get out of bed. - Developed by Philips, experts in light for over 100 years. At your set wake up time a natural sound will play to complete the wake up experience and ensure you are awake. The selected sound gradually increases in volume to your selected level within one and a half minutes. There are two natural bird sounds you can choose from. and even set up to 200 lux. lighting still is the soul of Philips. The Wake-up Light is proud to continue its heritage by building on years of knowledge and expertise of the world's most well- known lighting expert. it improves your mood in the morning. light stimulates your body to wake up naturally. By the time light has filled the room your chosen natural sound completes the wake up experience, leaving you ready for the day ahead.